I have written several posts looking at the new College Scorecard and its inherent flaws in the data, often starting with observations from Russ Poulin at WCET. Today Susan Svrluga, education reporter at the Washington Post, posted a new article co-written by me and Russ and titled "Hundreds of colleges missing from Obama’s College Scorecard?". The gist of the article is taking a holistic view of data problems and why they exist. 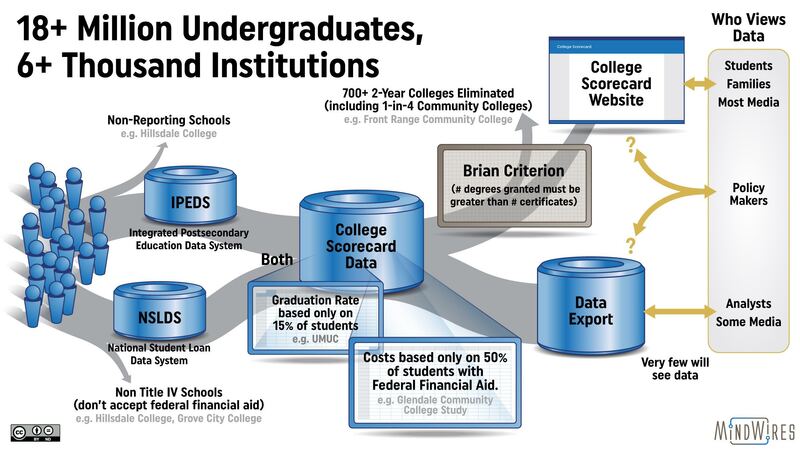 In a nutshell, the College Scorecard combines data from multiple sources – primarily from the Education Department’s own Integrated Postsecondary Education Data System (IPEDS) and National Student Loan Data System (NSLDS) – and publishes the results of both as a consumer-facing Web site and an analyst-friendly data download. The essence of the problem is that throughout this process the data is filtered based on questionable assumptions, leading to the fuzzy lens viewing subsets of the real data.